Private equity recapitalizations—as a percentage of all transactions—are on the rise. The primary driver for these middle market recapitalizations is a growing amount of private equity available combined with the aging baby boomer generation. At some point, most of these business owners will have to decide whether to reinvest all free cash flow and remain in their businesses in order to continue to grow or to sell for liquidity and tax consideration. Generally, a recapitalization is a transaction resulting in the alteration of a company's capital structure. Recapitalizations can involve an exchange of debt for equity, equity for debt, or equity for equity. These transactions may or may not result in a majority ownership change. We generally think of private equity as a collective investment vehicle used to make investments in various equity (and sometimes debt) securities. At the OFS Energy Fund, we choose to focus on the lower middle market, which includes those companies with annual revenue of less than $200 million. In a typical recapitalization, a private equity investor buys a portion of the owner's interest in the business. The owner, who retains a portion of business ownership, can accomplish three objectives: (1) take capital off the table as a means of personal financial diversification, (2) remain involved in the operation, and (3) participate in the upside of a growing company and ultimate liquidity event. Finance and accelerate growth initiatives. Shore up a distressed balance sheet. Provide capital support in order to facilitate low cost bank debt. Remove an owner's obligation from personally-guaranteed borrowings. Present a liquidity event, allowing an owner to de-risk from what is probably his or her largest asset. Allow estate and succession planning to family or non-family members. Finance follow-on investment or acquisition-oriented growth. Experienced third-party managers and directors to complement existing resources with new ideas. Professional service providers such as lawyers and accountants who will help professionalize the business. Experience in the use of tax shielding tools, such as asset write-ups, accelerated depreciation tax treatment, and cost segregation analyses. Deal flow and acquisition expertise. A well-defined path toward a future sale by competitive auction. Expertise in executing an efficient exit – typically the private equity investor assumes an active role in the exit, a position that should benefit all owners. A strategic buyer is typically a larger company in the same or a related industry. Historically, strategic buyers have provided higher valuations than private equity investors for various reasons, including the ability to cut overhead to improve profit margins. However, there are a number of issues to consider when selling to strategic buyers. Strategic buyers tend to be larger organizations that may be hampered by the process and politics of being a "bigco" and likely will require a full sale of the business. In contrast, private equity investors can provide creative capital structures and have the ability to move quickly. Strategic buyers may not assign a role to the seller or the legacy management team. On the other hand, private equity investors generally rely on the expertise of the seller and his or her management team. Going through an auction process involving a strategic buyer increases the risk that competitors, customers, and employees may discover that the business is for sale, which can cause an adverse effect. Let's consider a private equity example. Larry owns an oilfield services company with revenue of $20 million and EBITDA of $5 million. Larry foresees multiple paths for growth and would like to remain active in management for a few more years, however he needs a liquidity event to provide capital for various expenses and he would like to reduce his financial risk by diversifying his family's assets. Larry looks for a private equity investor that can move quickly and help minimize any adverse effects to the company's employees, customers, and suppliers sometimes caused by a lengthy and distracting transaction. He partners with a private equity investor that surrounds him and his management team with additional resources, such as a professional CFO, experienced board members, and flexible bank debt. Larry agrees to sell the company for $20 million. Because there is $2 million in bank notes, Larry (as sole shareholder) is eligible to receive $18 million in equity value. He decides to take out $14 million and re-invest $4 million. The private equity investor and the bank determine that the company can support $8 million in debt. Therefore, the new capital structure will consist of $8 million in debt and $12 million in new equity. The equity consists of $8 million in new equity from a private equity investor (for 67% ownership, $8mm/$12mm) and $4 million from Larry (for 33% ownership, $4mm/$12mm). Note, by using low-cost bank debt in moderation, Larry's $4 million reinvestment is worth significantly more as a percentage than it was under the old structure (22% ownership, $4mm/$18mm). The recapitalized company also has a revolving line of credit from which it can draw working capital for growth and opportunistic capital investments. Additionally, the new equity investor offers a 10% incentive equity pool, which provides extra incentive to the management team to hit significant growth targets. At the end of five years, through a combined effort of the company and the private equity investor, the company sells for $45 million (a 5-X Enterprise Value/EBITDA multiple) to a strategic buyer. The result is in an additional liquidity event of $13.5 million for Larry. In addition, the private equity investor receives $27 million for a 3-X cash-on-cash return on its investment and the management team is additionally rewarded with $4.5 million from the 10% incentive equity pool. 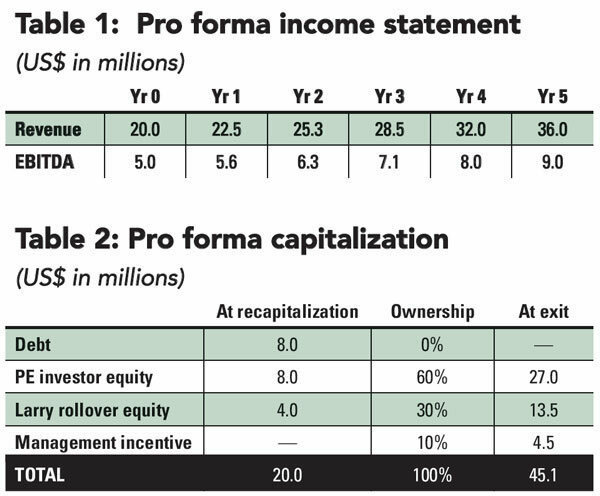 The simplified illustration shown in Table 2 is an example of how a private equity recapitalization can help Larry accomplish two goals: (1) obtain an immediate $14 million in take-home liquidity and (2) get an opportunity to maintain a significant ownership position in the company for another five years in order to get a "second bite of the apple" in an amount of $13.5 million (for a total of $27.5 million). Other notable results, which may not be so apparent, include the private equity investor's 3-X return and management's $4.5 million performance incentive bonus—all achieved in five years. And, all of this was achieved with a conservative debt profile whereby leverage was conservative, never exceeding two times EBITDA. Another positive factor in the illustration is the "multiple uplift" achieved from the original private equity recapitalization (4-X EBITDA) to the eventual exit (5-X EBITDA). Typically, multiple expansion is achieved as a company gains size and scale and professionalizes its systems and financial reporting. In addition to the transaction statistics, it's important to note that jobs are created and lives are changed as companies grow. Bruce Ross is managing partner of OFS Energy Fund and was a co-founding partner and managing partner of Dorado Energy Partners LLC where he directed the investment strategy and operations of the fund. Prior to Dorado, he served as CEO of Lone Star Fasteners, a company he formed in 2003 to acquire Lone Star Screw and Walker Bolt. Previously, he was a vice president in the energy investment banking groups of Royal Bank of Canada (RBC) and Jefferies & Company. Prior to RBC, he worked for Hibernia National Bank in New Orleans for 16 years in various commercial lending functions including manager of the Energy Service Lending Group. Ross earned a BS in economics from Southern Methodist University in Dallas and attended the Presidents' Seminar at Harvard Business School.